After a successful trial project in several major US cities, the FBI has announced that it will reward upwards of $10,000 for information leading to the arrest of anyone who intentionally aims a laser at an aircraft. 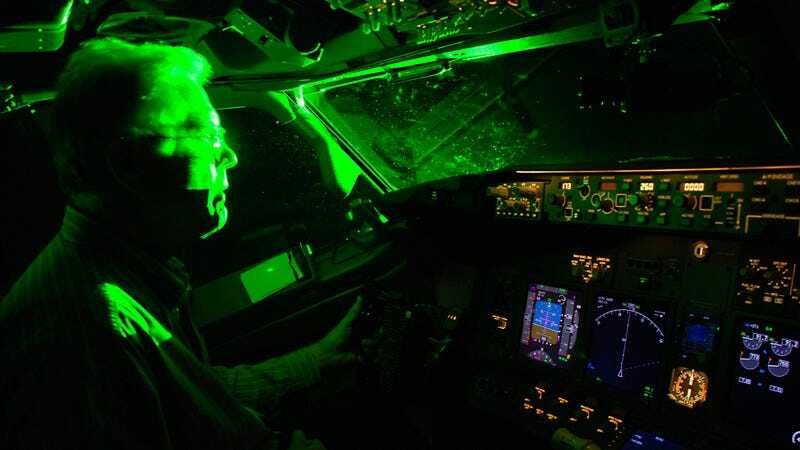 When aimed at an aircraft, the powerful beam of light from a handheld laser can travel more than a mile and illuminate a cockpit, disorienting and temporarily blinding pilots. Those who have experienced such attacks have described them as the equivalent of a camera flash going off in a pitch black car at night. As of December 2013, the FAA had documented at least 35 incidents where pilots required medical attention after a laser strike. It's a federal crime to interfere with the operation of an aircraft, and a new law in 2012 made it a felony to knowingly point a laser beam at an aircraft. Back in March, for example, a 26 year-old man was thrown in prison for 14 years after aiming his laser pointer at a police helicopter and a hospital emergency transport helicopter. The man and his girlfriend were using a device that was 13 times more powerful than the permissible power emission level for handheld lasers (girlfriend is currently serving a two-year prison sentence). "Aiming a laser pointer at an aircraft is a serious matter and a violation of federal law, said the FBI's Joe Campbell in a statement. "The public awareness campaign we launched in February has been effective in reducing the number of incidents, and our hope in expanding the program is that people will think twice about illegally using these devices." The initiative resulted in a 19% decrease in the number of reported incidents where it was deployed, including Albuquerque, Chicago, Cleveland, Houston, Los Angeles, New York City, and Philadelphia. "We want to encourage people to come forward when they see someone committing this crime, which could have terrible consequences for pilots and their passengers," added George Johnson, a federal air marshal who serves as a liaison officer with the Bureau on laser issues. The FBI says that if you have information about a lasing incident or see someone pointing a laser at an aircraft, call your local FBI office or dial 911.